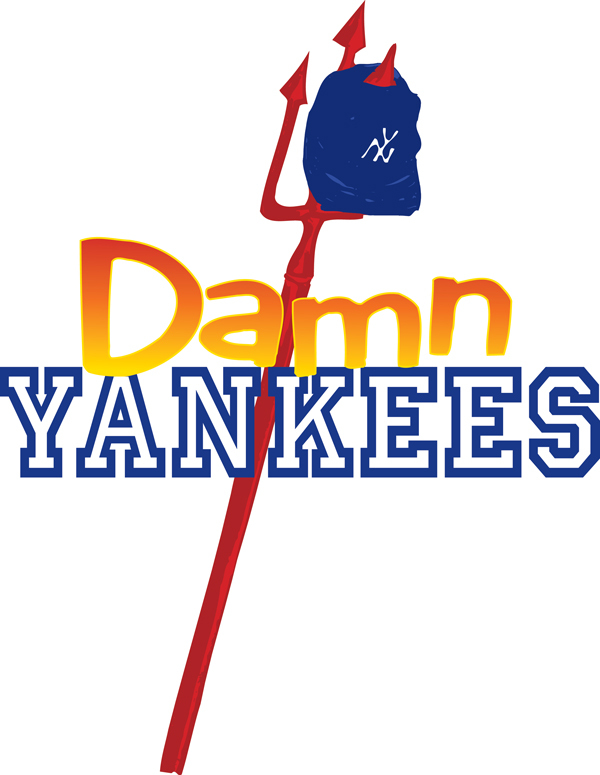 This March, GCTC will present Damn Yankees as its Spring 2019 Musical. Based on the novel, The Year the Yankees Lost the Pennant by Douglass Wallop, Damn Yankees the Broadway mega-hit and winner of seven Tony Awards, including Best Musical, hits it out of the park! The winning score by Adler and Ross and a devilish book by George Abbot have made this sporty musical comedy a true American classic. Middle-aged baseball fanatic Joe Boyd, trades his soul to the Devil, also known as Mr. Applegate, for a chance to lead his favorite team to victory in the pennant race against the New York Yankees. As young baseball sensation, Joe Hardy, he transforms the hapless Washington Senators into a winning team, only to realize the true worth of the life that he's left behind. Joe ultimately outsmarts Applegate, returns to his former self and shepherds the Senators to the World Series. Light, fast-paced and devilishly clever, Damn Yankees is a homerun hit, featuring all-American subject matter and an irreverent sense of humor. The perfect choice for a high school's spring musical or community theatre production, Damn Yankees is a wicked, romantic comedy, sure to please. Saturday, March 9, 2019 at 2:30 p.m. and 8:00 p.m.
Sunday, March 10, 2019 at 2:30 p.m.
Friday, March 15, 2019 at 8:00 p.m.
Saturday, March 16, 2019 at 8:00 p.m.
*General Admission will be complimentary for GC's students, faculty and staff. Check-in will be required. Students must show ID. Tickets will also be available at OLGCHS’ Box Office 2 hours before each performance. For years, Shakespeare's words were particularly true for the Good Counsel Theatre Company, as it had to mount productions in gymnasiums, dining halls, hallways, and at other schools. Now, with their very own 660 seat Performing Arts Center, replete with a set design shop, a costume shop, and an additional black box theater, GCTC is able to create theatrical performances that delight, move, and awe the audience right here at home. Each year, the Good Counsel Theatre Company presents two main-stage productions. In the fall, GCTC produces a comedy or drama and in the spring they stage a musical. There are also opportunities to perform in smaller productions during the winter. For those students who aren't seeking the spotlight, Good Counsel offers the opportunity to join the stage crew. As a part of the stage crew, students learn how to design, build, and paint sets, design and fabricate props, design lighting and sound effects, design and construct costumes, design and apply makeup effects, and manage the stage. In addition to the GCTC, which is an extracurricular activity, Good Counsel also provides several theatre courses that allow students to explore the depths of their talents in acting, directing, and other aspects of theatre design. Students explore the basic elements of theatrical performance through pantomime, improvisation, open scenes, tableaux vivant, monologues, and playwriting. This class helps students to overcome stage fright, learn public speaking skills, as well as the art of creating a character. Students will be assessed through various methods, namely journal reflections, quizzes, and performance assessments. Students augment their performance skills with technical studies in set, costumes, lighting & sound design. Through play analysis, students will learn how the art of design, rendering, building models, and basic stage craft are used to develop a production. Students will also use technology to engineer lighting & sound design. This class continues student learning from Acting for the Stage and completes the pre-requisite for upper-level Theatre courses. This course will cover all aspects of theatrical design, direction, and production including playwriting, dramaturgy, character development, design (scenic, lighting, costume, sound, hair & make-up), production/stage management, and directing. Students devise their own theatrical pieces through hands-on, practical experience. Through collaboration with classmates, students will get to advance their production skills and foster their own creativity. This class requires participation in the 24 Hour Play Festival. Advanced acting and directing is intended for the serious acting student who wants to focus on developing a high level of acting skills that extends beyond those covered in Acting for the Stage & Advanced Studies in Theatre. Students will explore a variety of acting roles through exercises, monologues and scene work. The curriculum will cover both classical and contemporary theatre work as students explore physical movement, voice technique, and character development. Through the course students will develop an audition book and a personal acting method. Students will collaborate with their peers as they explore the actor/director relationship and learn to make thoughtful artistic decisions that support the dramatic content of the action. The IB Theatre course is a multifaceted theatre-making course of study. It gives students the opportunity to make theatre as creators, designers, directors, and performers, and emphasizes the importance of working both individually and collaboratively as part of an ensemble. Students experience the course from contrasting artistic perspectives. They are encouraged to appreciate that through the processes of researching, creating, preparing, presenting and critically reflecting on theatre— as participants and audience members—they gain a richer understanding of themselves, their community and the world. It enables students to discover and engage with different forms of theatre across time, place and culture and promotes international-mindedness. In order to maintain a high standard of production as well as a meaningful and hands-on learning experience for our students, GCTC pairs our students with professional theatre mentors. The program was established and is currently run under the guidance of our Producer, Rosemary Pardee Slocum.